There is something to be said about that vintage look. 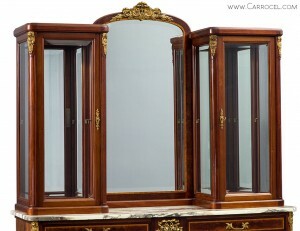 It is timeless, elegant and can add a touch of class to your home. An antique mirror is not always easy to come by, but there are ways you can distress a modern mirror and give it an aged look. Most of the supplies you will require can be found easily at your local home improvement store. Create A Work Area – Protect your work area with newspapers or a craft tarp. This will prevent any spills from harming the surface below. Be sure that your work surface is flat—any drips can ruin the antique mirror effect. The work area must be well-ventilated too, since you are working with potent vinegar and spray paint. Vinegar Spray – Fill a spray bottle with equal parts of vinegar and water. Then, mist the back of the mirror evenly using your vinegar and water solution. Next, coat the back of that misted glass surface with looking-glass spray (available at your hardware or craft store). Once dry, dab away droplets with a paper towel. Repeat the process three to four times until you create a layered texture. Accent – For more depth, you can add a touch of gold and black spray paint to the dried surface. This is optional, and should only be done after the looking-glass spray has dried completely. While it is easy enough to create an antique mirror at home, it will not have the same aged, quality look as one that is a true antique. Carrocel has high-quality antique mirrors that have been expertly preserved and are timeless pieces of treasure for your home. Visit our showroom for top-quality pieces to enhance your home décor. Visit or call us today at 416-999-2525.